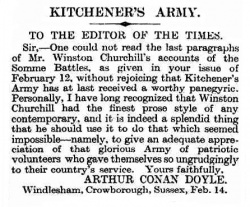 Kitchener's Army is a letter written by Arthur Conan Doyle first published in The Times on 15 february 1927. Sir, — One could not read the last paragraphs of Mr. Winston Churchill's accounts of the Somme Battles, as given in your issue of February 12, without rejoicing that Kitchener's Army has at last received a worthy panegyric. Personally, I have long recognised that Winston Churchill had the finest prose style of any contemporary, and it is indeed a splendid thing that he should use it to do that which seemed impossible — namely, to give an adequate appreciation of that glorious Army of patriotic volunteers who gave themselves so ungrudgingly to their country's service. This page was last edited on 23 July 2017, at 13:10.